At times, it’s good to seize the atmosphere by putting laughter on the faces of ones’ friends and associates. In fact, there are several ways to contribute a definite and lasting smile on the faces of colleagues. So, if you need an idea, then I’ve got one right here for you. Come to think of it, how funny would it be, that your dad with large bod claims he’s got a six-pack? Isn’t that ridiculous? Of course, it is. 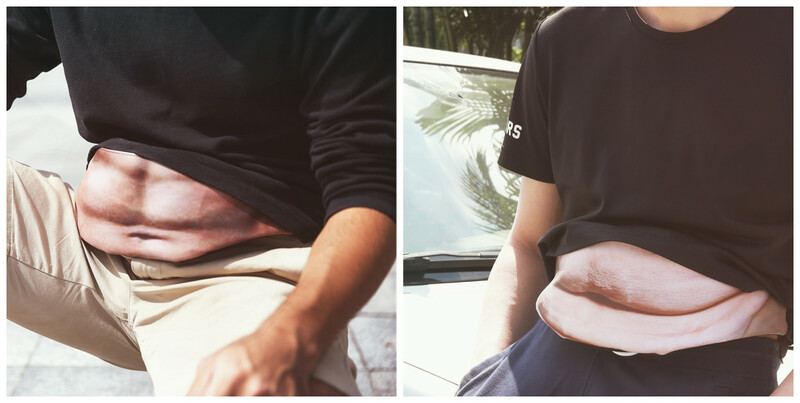 Definitely, you can surprise your friend with abrupt possession of “daddy’s” bod. How would that be possible? It’s all with the help of the belly fanny pack. The pack is designed in a manner that observers from afar would have this picture whether the user has gotten a fat hairy stomach. As This fanny pack covers a regular waste of (at least) a height of 6 inches. This quirky pack hugs the waist of users flawlessly that it’s capable to make observers wonder what kind of bod the user have got that it’s become difficult for vests to cover. In fact, it becomes even more ridiculous when a slim individual uses this, as it’s capable of making observers perplex how real it could be for. With 3D-painting designs, this bag looks a replica of a hairy man large bod. But the interesting fact is that when the user approaches, then they’ll know that it’s just a fanny pack. Apart from the hilarious 3D- printing design, it is made with a zipper for the easy closure and it lasts longer. Of course, there are several fanny packs that have their zipper at the front of the bag. But the belly fanny pack is not designed that way. The zip is located at the rear part of the bag but around the top. There is a reliable buckle that sturdily cleaves the fanny pack to your waist. In fact, you can wear it for straight twelve hours and you’ll still be comfortable as it has breathable reticulate. Wearing this won’t cause marks on your waist and it can be worn by both male and female. The waist fanny pack does the same function like any fanny pack that you’ll find anywhere in the world. This is as a result of great intuitive and creative works. 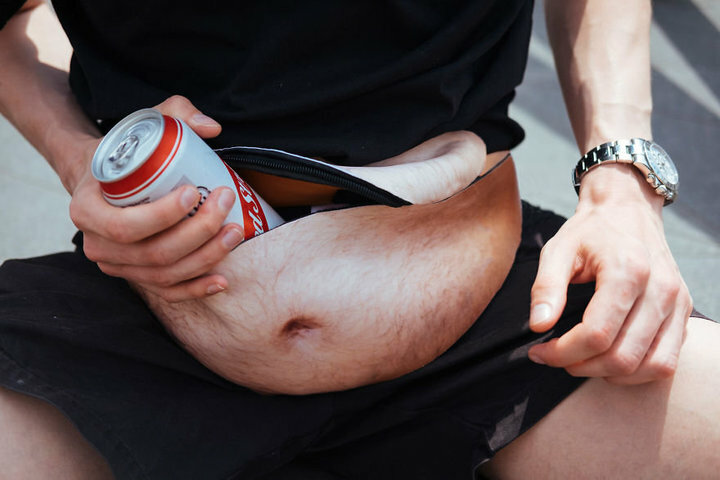 In spite of its fashionable design, this waist-hug fanny pack is spacious, you can put your can drinks in it. Not only that, it can contain as many items as you want. 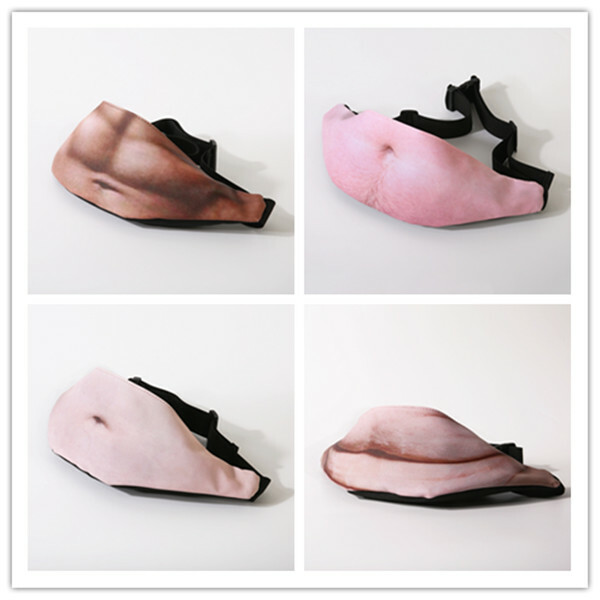 “You don’t get daddy’s bod torn even if there are many items in it.” The bod-like fanny pack has a good tensile strength, in order to keep users at comfort while using it. The bottom line is that the belly fanny pack is more than a waist-hug fanny bag but it’s a fashionable bag that’s made as a hairy man’s bod. The pack is comfortable to use and it has enough space to keep items of various sizes and weight at the same time.